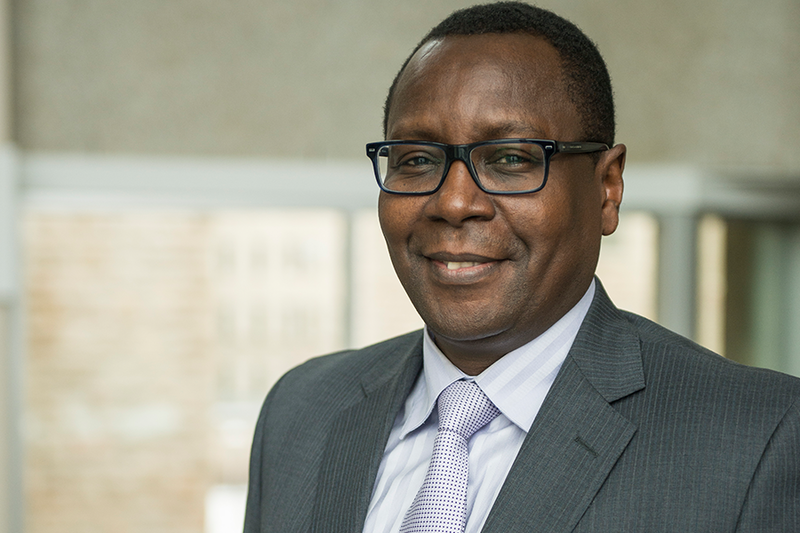 George Mutwiri, interim director of the School of Public Health. On the heels of the March 2015 external review of the School of Public Health, a series of consultations took place to determine next steps for the school. From September to December 2015, the task force charged with this undertaking met with 68 individuals, including faculty, staff and students in the school and in the College of Medicine's Department of Community Health and Epidemiology, senior administration at the university, as well as many external partners, explained interim Provost Ernie Barber. Stemming from those consultations, a series of eight recommendations were made, Barber said. Top among them is that "the School of Public Health should remain a distinct, free-standing academic and research entity," with this status being re-evaluated within two years. "One of the many important outcomes of the external review and of the task force analysis is a recognition that, while the relationships between the school and the Department of Community Health and Epidemiology are important, there should be no intention or expectation that these two units be merged," explained Barber. For George Mutwiri, the school's interim executive director, this is a key takeaway. "That there is consensus among internal and external stakeholders that the school remain independent is very important. That is a really positive message." Barber stressed that while there is no expectation of a merger, faculty of both units must meet as soon as possible to review the task force report and "clarify expectations that each has of the other during the upcoming work to refresh the vision of the school, to develop goals and to recruit the school's next executive director." And while internal and external stakeholders reached consensus on the best governance structure for the school, Mutwiri said there was also consensus on the need for the school to strengthen relationships. "Going forward there is an expectation to build stronger relationships, both on and off campus," said Mutwiri. "In this regard, we will be holding consultations that are necessary to move forward and refresh the mission, vision and goals of the school." Another outcome of those consultations, Mutwiri continued, is the "development of a strategic plan for the next five to 10 years." Barber said that in response to the eight recommendations of the report, Mutwiri has been tasked with developing precise goals and metrics in order to evaluate progress. "I have asked that those be developed and endorsed by the Provost's Committee on Integrated Planning by June 30, 2016, and followed by annual reports on progress," said Barber. Another immediate action, Barber continued, is that the search for the school's next executive director—a search that was suspended pending the development of a university response to the external review—is to be resumed immediately. "The successful candidate will be one who embraces the challenge of rebuilding the School of Public Health and who recognizes the expectation of an internal unit review two to three years into their mandate," Barber said. While the task force's report, echoing the external review, recognized that status quo is not sustainable, Mutwiri said the report also highlighted a number of ongoing improvements in the school over the past year. "It found that the student learning experience in the school was very good, very positive and improved from the previous years," said Mutwiri, adding that he felt that faculty engagement has also improved. Additionally, Mutwiri continued, the report also pointed to all the potential within the school, specifically "the impact the school can have in a province with such a large Indigenous population. And again, that will require more consultation with Aboriginal communities." Mutwiri acknowledged that there is lots to do and that "We are going to be very busy in the coming months."